And then, it’s as if McIlroy had a lightbulb go off in his head that he was on the cusp of greatness, and wasn’t quite ready for the stage. The result was a final round 80, leaving McIlroy well out of contention, as he watched Charl Schwartzel claim the Green Jacket. While that performance might have set back a normal player sometime from a mental perspective, for McIlroy it was the exact opposite. He came back in the very next Major Championship, the U.S Open, with a renewed vigor and determination. As if the crumble at the Masters never even happened, McIlroy blew away the field to win the U.S Open by eight shots for his first Major championship win. And since, McIlroy has taken off, at one point earlier this season claiming the No.1 ranking in the world. 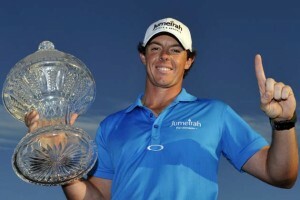 Though he has fallen back to No.2 in the world, McIlroy comes into the 2012 Masters as one of the top favorites to win. Rory McIlroy Masters Betting Odds are available at Bovada Sportsbook, with his odds sitting at 9/2 to win the Green Jacket. He is behind only Tiger Woods. In fact, McIlroy and Woods were tied atop the betting odds to win the Masters, until Woods captured the Arnold Palmer Invitational with a five-shot win. That result set Woods atop by himself, though McIlroy is just behind. This is one of the most-compelling Masters ever as we go into the first Major championship in 2012, with golf in a great place around the world. McIlroy knows that he can score at Augusta, but it’s a matter of putting all four rounds together.